The Brevard County doctor who was arrested for groping a woman while dressed as Captain America with a burrito in his pants will not go to jail. Pretty good. Apparently (and to my great surprise, but Google doesn’t lie) I did not report on the arrest last month of Captain America, otherwise known as Dr. Raymond Adamcik of Brevard County, Florida. Adamcik, reportedly a family physician, dressed as Captain America as part of a costume pub crawl for medical professionals. He included as part of his costume a strategically placed burrito (hint: it wasn’t in back), apparently concerned that his own burrito would not look sufficiently super-heroic. According to the report, at one stop on the crawl, a probably alcohol-fueled Captain got "too forward," first employing the burrito and then his hands. The gropee called police, who faced an unusual problem when they arrived. According to the police report, "There were so many cartoon characters in the bar at the time, all Captain Americas were asked to go outside for a possible identification." A Captain-America lineup. What has this country come to? 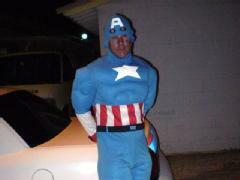 After the woman identified the Captain America who had groped her, police arrested him and took him down to the station. Once there, it turned out that our hero also had a couple of joints in his costume (presumably in a different location than the burrito). His attempt to flush them down the toilet at the police station left him facing potential charges of drug possession and destroying evidence. The charges were later reduced, however, and in exchange for agreeing to a diversion program including fines and community service (presumably rescuing somebody from something), Captain America With a Burrito in His Pants will not go to jail.